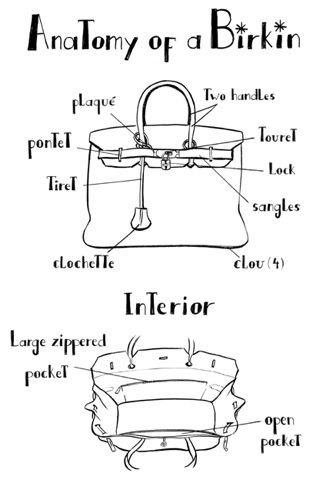 The Birkin Bag is without a doubt the most sought after handbag in the world. Often seen dangling on the arms of celebrities, this it bag is also a top item on every fashionista’s wish list. Named after actress and singer Jane Birkin, the bag is handmade in leather and are sold in a range of sizes. Prices depend on the color, hardware fixtures, and skin and range from £6,000 to £100,000 ($9,000 to $150,000). Costs escalate according to the type of materials or fabrics used. This coveted item can easily be a lifetime of savings for the average fashionista, but a girl can dream right! With Couture week in the air I thought I would get myself educated on what really is ‘haute couture’. Today the term is a favourite amongst the fashion crowd and some may say it’s overused and misused. A French word for ‘high sewing’ or ‘high dressmaking’ or ‘high fashion’, it’s defined as the exclusive creation of custom-fitted clothing. Haute Couture are pieces made to order for special and usually wealthy clients; made to each wearer’s measurements and body stance. Each piece is made from high-quality and expensive fabrics, sewn by the most experienced seamstress. So what do these two words actually mean? Well ‘Haute’ means elegant or high. ‘Couture’ means dressmaking or sewing. Makes sense right! Unlike having a regular fashion house, in France ‘Haute Couture’ is protected by law and defined by the ‘Chambre de commerce et d’industrie de Paris’ based in Paris, France. •Design made-to-order for private clients, with one or more fittings. •Have a workshop (atelier) in Paris that employs at least fifteen people full-time. •Must have twenty full-time technical people in at least one atelier (workshop). •Each season (i.e., twice a year), present a collection to the Paris press, comprising at least thirty-five runs/exits with outfits for both daytime wear and evening wear. Phew! So when you do view these amazing creations during couture week this should make you have more of an appreciation for these designers. Not to mention alot of designers today produce both their ready-to-wear and couture collections back to back. No days off for them means a full week of beautiful fashion for our viewing pleasure.